Goals + projects are terms that often are used interchangeably. When it comes to planning + organising my day I found it easier when I separated the two. While they are similar, I think of goals as the actions you take to be the kind of person you want to be. And projects are things you want to accomplish. Think of it as separating who you are or want to be, from what you do. Today we’re going to focus on our goals, the things we need to do to be the person we want to be. For me goals are about daily habits, or non-negotiables as I like to call them. They are what I need to do to be the kind of person I desire to be. They are my guiding light for each day. No matter what else I want to achieve in life I know that to be the best version of myself, these are the things that I want + need to do. I have three areas I set goals for : spirit, soul + body, and a few activities in each I want to do each day. These are what I intent to do no matter what else I’m working on. My daily habits are to read, journal + prayer, eat healthy + exercise and last but not least, sleep + rest. These things don’t happen automatically + I’m not perfect at them, which is why I call them goals. When I get these things done each day, I feel great knowing that I’m taking care of myself + preparing for what is ahead. Each activity doesn’t take a long time to do + yet if I don’t consciously decide up front what is important, my day can get away from me. Once we had our son, we quickly learned that life is made up of seasons. And some last longer than others. Just as we would get our routine settled, we’d enter a new phase and it would change. Isn’t that the way when raising children!? So as life changes the specific details in how I go about my goals changes too. What I do during winter is different than summer. And yet I know that I’m still taking care of these three key areas of my life. Is there something you want to change or be more consistent at? Maybe you want to give up smoking, lose a few kilos, read more boks or journalling each day. Break these goals into actions that you need to take on a consistent daily basis, and you will soon form the habits to be that person. To be successful we need some form of accountability. It’s easy to see your progress when you use a weekly or monthly habit tracker. And don’t forget to plan in some celebrations to reward your efforts. We all need encouragement + success should be rewarded! There’s no better time for a rest than today, so let’s dive in and set some goals. 1. ” Collect : make a list of the things you need to be doing to be the person you want to be. This is about the habits we need to establish to have the results we are looking for. What kind of person would you need to be to live that life? What kind so things would you be doing? Do you need to be fit + healthy? Would you like a strong mind + faith? How about being more connected to your spouse + children? Write down the kinds of things you need to be doing on a consistent basis to have the results you want in your life. 2. # Reflect : next we decide how to best set our goals by answering the following questions. Have a look over your list + group activities together that could form a morning or evening routine? Do you prefer using paper or digital app to track your progress? Are there things you need to work on your goals. 3. > Connect : this is the fun bit where you get to dive in + set up a plan that works uniquely for you. It’s time to shop for a habit tracker app or you could use the free version of Evernote. Set yourself up a note with checklists. Copy this template each day + check off each task as you complete it. Pop over and shop the Colour Your 365 planner printables to set up your own gorgeous planner. 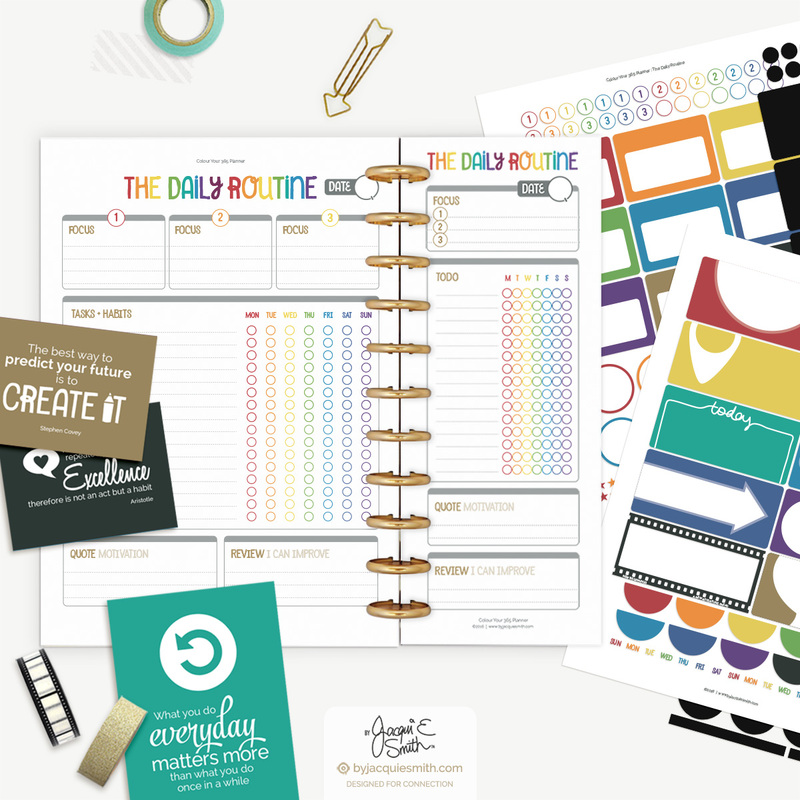 The Daily Routine Kit was specifically designed with built in accountability, checking off tasks as you complete them. With the full page or bookmark + stickers, your on your way to becoming that person you desire to be!